Crimean Goths were those Gothic tribes who remained in the lands around the Black Sea, especially in Crimea. They were the least-powerful, least-known, and almost paradoxically, the longest-lasting of the Gothic communities. Their existence is well attested through the ages though the exact period when they ceased to exist as a distinct culture is unknown; as with the Goths in general, they may have been diffused with the surrounding peoples. In the Fourth Turkish letter by Ogier Ghiselin de Busbecq, they are described as "a warlike people, who to this day inhabit many villages" though in the 5th century, Theodoric the Great failed to rouse Crimean Goths to support his war in Italy. At the time, it was customary to refer to a wide range of Germanic tribes as "Goths", so the exact ethnic origin of the Germanic peoples in the Crimea is a subject of debate. Aside from textual reports of the existence of the Goths in Crimea, both first and second hand, from as early as 850, numerous archaeological examples also exist, including the ruins of the former capital city of the Crimean Goths: Doros, or Mangup as it is now known. On top of this, there are numerous articles of jewelry, weaponry, shields, buttons, pins, and small personal artifacts on display in museums in the Crimea and in the British Museum which have led to a better understanding of the Gothic Kingdom. In the report made by Ogier Ghiselin de Busbecq in 1595 of the Crimean Goths, he claims to not be able to determine whether the Germanic peoples of Crimea were Goths or Saxons, certainly the language cannot be directly linked to the well-attested Gothic language. Though most scholars agree the peoples must have been of Gothic origin, some others have maintained that the so-called "Crimean Goths" were in fact West or even North Germanic tribes who settled in the Crimea, culturally and linguistically influenced by the Ostrogoths. According to Herwig Wolfram, following Jordanes, the Ostrogoths had a huge kingdom north of the Black Sea in the 4th century, which the Huns overwhelmed in the time of the Gothic king Ermanaric (or Hermanric; i.e. "king of noblemen") when the Huns migrated to the Russian steppe. 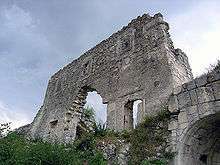 The modern day ruins of Mangup (Doros): Capital of the Crimean Goths. The Ostrogoths became vassals of the Huns until the death of Attila, when they revolted and regained independence. Like the Huns, the Goths in Crimea never regained their lost glory. According to Peter Heather and Michael Kulikowski, the Ostrogoths did not even exist until the 5th century, having emerged from other Gothic and non-Gothic groups. Other Gothic groups may have settled in the Crimea. It has also been speculated that the Crimean Goths were in fact Saxons escaping Christian persecution from the west, or North Germanic tribes who migrated southwards. Either way, the existence of Goths in Crimea is first testified from around the 3rd century, and after that they were well reported. During the late 5th and early 6th century, the Crimean Goths had to fight off hordes of Huns who were migrating back eastward after losing control of their European empire. In the 5th century, Theodoric the Great tried to recruit Crimean Goths for his campaigns in Italy, but few showed interest in joining him. The Principality of Gothia or Theodoro formed after the Fourth Crusade out of parts of the Byzantine thema of Klimata which were not occupied by the Genoese. Its population was a mixture of Greeks, Crimean Goths, Alans, Bulgars, Kipchaks and other nations, which confessed Orthodox Christianity. The principality's official language was Greek. The territory was initially under the control of Trebizond, and possibly part of its Crimean possessions, the Perateia. Many Crimean Goths were Greek speakers and many non-Gothic Byzantine citizens were settled in the region called "Gothia" by the government in Constantinople. A Gothic principality around the stronghold of Doros (modern Mangup), the Principality of Theodoro, continued to exist through various periods of vassalage to the Byzantines, Khazars, Kipchaks, Mongols, Genoese and other empires until 1475, when it was finally incorporated in the Khanate of Crimea and the Ottoman Empire. There is a theory that some Anglo-Saxons who left England after the Battle of Hastings in 1066 arrived in Constantinople in time to help the Byzantines repel an invasion. 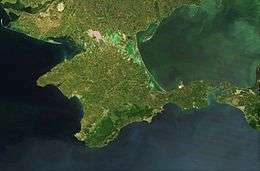 As a reward, the Byzantine emperor granted them lands near the Sea of Azov in what may have been the Crimean Peninsula. By the 16th century, the existence of Goths in the Crimea had become well known to European scholars. Many travelers visited the Crimea and wrote about the Goths. One romantic report appears in Joachimus Cureus' Gentis Silesiae Annales in which he claims that during a voyage in the Black Sea, his ship was forced ashore by storms. There, to his surprise, he found a man singing a song in which he used "German words." When he asked him where he was from, he answered "that his home was nearby and that his people were goths". 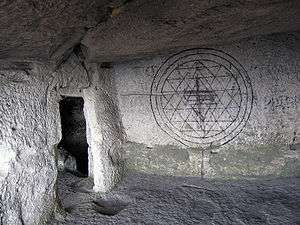 Several inscriptions from the early 9th century found in the area use the word "Goth" only as a personal name, not ethnonym. Meanwhile, some legends about a Gothic state in Crimea existed in Europe throughout the Middle Ages. In the 16th century, an Imperial envoy in Suleiman's court Ogier Ghiselin de Busbecq reported having had a conversation with two Goths in Constantinople. He also left the Gothic-Latin dictionary with about a hundred Germanic words that share some traits in common with the ancient Gothic language. Following the report by Busbecq, numerous European travelers went to visit the Crimea, Torquatus visited the Crimea in the mid- to late 16th century in which he reported the existence of Goths who spoke their own language, but used Greek, Tatar and Hungarian in dealing with outsiders. The language spoke in the Peninsula Crimea, or Taurica Chersonesus, in Asia, still retains many German words, brought thither, as is suppos'd by a colony of Goths, who went to settle there about 850 years after the Deluge. The late Mr.Busbeq, who had been Imperial Ambassador at the Ottoman Port, collected and publish'd a great number of these words in his fourth letter; and in my own travels through that Country I took notice of many more. The first report of the Crimean Goths appears in the Vita of Saint Cyril, Apostle to the Slavs (Constantine the Philosopher) who went to Crimea to preach the gospel to the Khazars [c. 850]. He lists "Goths" as people who read and praised the Christian God "in their own language". In 1606 Joseph Justus Scaliger claimed that the Goths of Crimea read both the Old and New Testaments "in the letters of Wulfila's alphabet". These are the only two reports which refer to the existence of a written form of Crimean Gothic, but also confirm their Christian faith. While initially Arian Christians like other Gothic peoples, the Crimean Goths had fully integrated with the Trinitarian Roman Church by the 6th century. Following the split of the Church, these peoples would remain loyal to Constantinople as part of the Eastern Orthodox Church. In the 8th century John of Gothia, an Orthodox bishop, led an unsuccessful revolt against Khazar overlordship. The language of the Crimean Goths is poorly attested with only 101 certain independent forms surviving, few of which are phrases, and a three line song, which has never been conclusively translated. Possible loan words are still used in Crimean Tatar though this too remains highly speculative. There are numerous other sources referring to the existence of Goths in the Crimea following Busbecq's report, though none providing details of their language or customs. The last known record of the Goths in Crimea comes from the Archbishop of Mohilev; Stanisław Bohusz Siestrzeńcewicz c. 1780, who visited Crimea at the end of the 18th century, and noted the existence of people whose language and customs differed greatly from their neighbors and who he concluded must be "Goths". Despite no further records of the language's existence since the late 18th century, communities of Germanic peoples with distinctly separate customs and physical features have been recorded living in the Crimea, leading some to believe that the Gothic language may have survived as a "haussprache" (home language) until as late as 1945. According to the Soviet Ethnologist V.E. Vozgrin the Goths interbred with the Crimean Tatars and converted to Islam. In The Crimean Tatars: the diaspora experience and the forging of a nation by Brian Glyn Williams they quote Vozgrin as saying; "In all probability their descendents are the Tatars of a series of villages in the Crimea, who are sharply delineated from the inhabitants of neighboring villages by their tall height and other features characteristic of Scandinavians." It is clear that the Goths had begun to speak Crimean Tatar and Crimean Greek from long before the arrival of Busbecq thus they may well have integrated into the wider population, as later visitors to Mangup were unable to discover "any trace" of Gothic peoples. Almost no signs of the Crimean Goths exist today. It was claimed by the Third Reich and by Adolf Hitler that the Crimean Goths had survived long enough to interbreed with later German settlers in Crimea, and that the German communities in Crimea constituted native peoples of that area. He had intended to re-settle German people to Crimea, and rename numerous towns with their previous Crimean Gothic names. During the Nazi occupation of Crimea, Sevastopol was changed to Theoderichshafen. There was talk among Nazi officials of building a superhighway between Berlin and the Crimea, turning Crimea into the German Gibraltar. ↑ Heather, The Goths 52-55. ↑ Heather, Goths in the Fourth Century 92 n. 87. ↑ Herwig Wolfram, Die Goten, 2001, S. 32. Heather, Peter. The Goths. Blackwell, 1998. Heather, Peter and John Matthews. Goths in the Fourth Century. Liverpool Univ. Press, 1991. Kulikowski, Michael, Rome's Gothic Wars: From the Third Century to Alaric. Cambridge Univ. Press, 2006. Vasiliev, Aleksandr A. The Goths in the Crimea. Cambridge, MA: The Mediaeval Academy of America, 1936. Wolfram, Herwig (Thomas J. Dunlap, tr). History of the Goths. Univ. of California Press, 1988.